As parents ourselves, we understand that the first few months are one big blur of late nights, early mornings and lack of sleep! Getting your child down to sleep becomes one of the most important parts of the day. 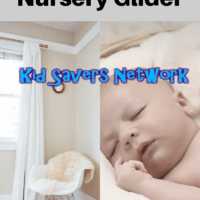 This makes a nursery glider a real godsend! Of course, gliders / rockers have been lovingly used by parents for generations. Gliders provide a relaxing and calming motion that soothes your baby to sleep. They’re also great for nursing your baby, too. As with all baby products, gliders can be very expensive which makes choosing the best one really important. 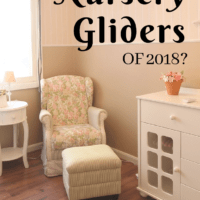 To help, we try to find the best nursery glider of 2019. We got used to our glider in the nursery so much, we decided to go shopping to put a few in our living room. We like to watch movies with Netflix, HBO, Hulu, and found our couch to be so uncomfortable. We really like the idea of a reclining chair like a La-Z-Boy, but the styling was so dated to us. Thru all of our research, it led us to re-think this glider review, and it brought us to our new favorite chair. 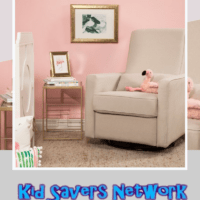 The DaVinci Piper Reclining Glider is a great glider for the nursery. It looks modern, is solid, without being overly heavy. And when it’s no longer needed, it can find a second home in the living room. Swivel: This is so we can have a living room conversation with family and friends. And when we want to look at the TV, we can easily swivel the chair. Glider: There’s nothing more soothing that being able to rock back-and-forth. Let’s be honest, it’s nice to rock your baby with a glider chair, but we parents enjoy it just as much for ourselves! Recline: Not a necessity for a nursery, unless your a dad that likes to let a baby sleep on your chest. But in a living room, kicking back with a recline and footrest (like you pay for in a premium movie theater), is downright awesome. We have our TV mounted above the fireplace, so it’s a bit high. With the recline, it’s easy to watch it now. Fabric: We love leather seats in our cars, but in our homes, found it to be cold in the winter and stick-to-legs in the summers. So fabric seating was a must, for comfort. The DaVinci Piper met all of the requirements above! Fabric came in beautiful grey and cream. Recline action is easy with the hidden lever. It’s easy to get it to a perfect recline position. And if you want nearly flat, it can go that far too. Glider action is smooth, smooth, smooth. Effortless to rock. Fits great for any height. We tested it with someone 5′ 0″ and 6′ 2″. All found it very comfortable. To return it to a non-reclined position, it takes some leg muscles (or technique) to get the footrest to “catch”. Once you figure it out though, its easy. 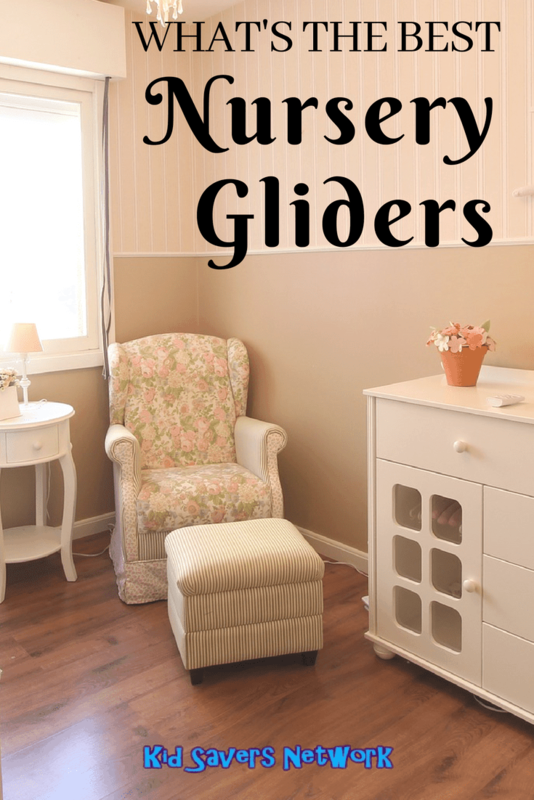 We highly recommend the DaVinci Piper Glider for nursery and living room! This chair split opinion amongst our testers! Some liked the design, finding it comfortable and easy to use. Others hated the look and compared it to furniture found in seniors homes and care facilities. Yes, the Dorel was the most “discussed” design of all our tested chairs! On the subject of features, it has a few that set it apart from other nursery gliders. It has an adjustable footrest (not a stand) and is also the only swivel glider chair on our list. The mocha-colored fabric and cushions are extremely well made, too. The gliding movement was smooth and gentle. It also reclined fully and one of our fathers fell asleep in this chair! Overall, we found the Dorel extremely well made, easily rivaling the Stork Bowback for its quality of construction. The cushions and adjustable foot support provided hours of comfort. The swivel feature is great as you can give your baby a different view of the nursery. We feel this would be the best nursery glider for plus size mothers due to its great construction and cushioning. Our main concern was the negative reaction some parents had to the design. However, searching on google tells me gray recliners are in demand – so what do I know?! The Dorel Relax is also the most expensive chair on the list so not great for those on a budget. However, if you’re looking for a well-made swivel glider this is the one for you. Another more traditional design comes courtesy of Naomi Home. For our tastes, it’s a more pleasing set of furniture to look at than the Stork unit. Once again, it features a solid hardwood construction with generously padding cushions and a fully adjustable footrest. The gliding movement was extremely smooth, beating the Stork hands down. The back is extra tall so you won’t be hunched over when you breastfeed. There’s also a lever to lock-in one of the three positions to help you and your baby feel more comfortable. However, we found that after a short period of usage the chair did begin to squeak slightly. We solved this by spraying a lubrication oil on the glider mechanism. Thankfully, this cured the issue but we have read other reviews that also mention a squeaking noise. Something to take into considering when using this chair for the first few weeks. Lubrication issues notwithstanding, we like the Naomi Home Sleigh very much. Comfort is easily up there with the other gliders tested and the construction has a quality feel to it. If it wasn’t for the squeaking this could be the best nursery glider out there. We found the Naomi Glider easy to assemble and reasonably priced considering the quality of materials featured. It was a joy to sit in for hours at a time and our child easily drifted off to sleep whilst using it. Product Dimensions Glider: 39.5 H x 25.75 W; x 24.75 D; Weight: 38 lbs. Ottoman Dimensions: 14.5 H x 16.0 W x 20.5 D; Weight: 12.0 Lb. Material / Construction Solid wooden frame makes Glider and Ottoman stability and durability. Closed Ball-bearings for smooth gliding and rocking motion. COMFORT: Generous seating room with thick cushions for maximum comfort and pockets to hold your belongings. Comes with matching Ottoman. Fill Material: 100 % Polyurethane Foam Easy spot cleanable. Assembly Beautiful and easy to assemble furniture that is ideal glider rocker for your nursery. Required tool set included. A more traditional glider set, the Stork Glider features a wooden frame, generously padded cushions and adjustable footrest. The cushions are not machine washable, however, they are stain treated so you’ll be able to spot stains away easily. This nursery glider set has also been accredited by the Juvenile Product Manufacturers Association, meaning it’s been tested to ensure its safe for both your and your child. During our tests, we found the Stork to be a nicely made (although very traditional) piece of furniture that should last the test of time. It proved to be quite comfortable for hours of sitting. The rocking motion was also smooth and gentle. Overall, we were quite impressed with the Stork Craft Hoop Glider given the price. We would recommend it to parents who are looking for the best glider for the money. You can find today’s price here, and see if you agree! Another Stork product, and following in the same footsteps as the Craft and Hook glider reviewed earlier. With this model, the quality is slightly better and we feel this chair can really rock! 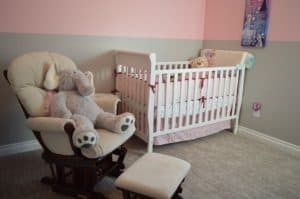 The design is somewhat traditional and may not be suitable with more modern nurseries. However, it’s a quality item made from solid wood, good fabrics and has a smooth rocking mechanism. We found the Bowback Glider to be a very nice piece of furniture to use every day. It was comfortable to sit in for moderate lengths of time. The adjustable foot stand was really appreciated by our tester parents. It made things much easier while breastfeeding and cradling babies. Assembly is nice and easily, guided by quite a decent set of instructions and quality assembly tools. The only issue we had was the price, however, you’ll be hard pressed to find a glider with a higher quality of finish! If you’re looking for a high-quality nursery recliner with an ottoman, be sure to check out the Beige Bowback from Stork Craft. The SoBuy glider has a very modern, northern European look and is made from a very strong frame. The cover is manufactured from laminated fabric, providing a fully washable chair that’s comfortable to sit in for lengthy periods. It also features an adjustable footrest, side pockets, and special mats to stop the chair damaging wooden flooring. Very convenient if your home is not carpeted. We found the SoBuy chair extremely comfortable, easy to use and keep clean. It’s a stylish design and would fit into a modern nursery quite easily without standing out. It’s easy to move and carry, so switching rooms with your rocking chair should be a breeze. We worried about the design of the chair at first, wondering how such thin pieces of wood could possibly survive the weight of mother and child. Needless to say, we were proved wrong! Northern European furniture design is widely regarded as the best in the world and that’s very true of the SoBuy glider. And the best thing about the SoBuy – the price!